The night of 12-12-12 was a study in contrasts for me. On the one hand, I was very fortunate to be able to attend the 12.12.12 Concert to benefit Hurricane Sandy victims. If you saw any of it on TV, then you have a sense of what an incredible experience it was. The emotions in Madison Square Garden were real and palpable. On the other hand, there was an extraordinarily challenging person standing next to me for over six hours (when she wasn’t excusing her way in front of me over a dozen times to fetch beer or whatever). Long story short: she spent much of the night invading my personal space. Perhaps you might say that it is ridiculous to expect to maintain personal boundaries during a crowded and often raucous concert. No disagreement there; I attend many concerts every year, frequently standing in general admission, and am well familiar with the experience of a tightly packed and enthusiastic crowd. I’ve done my time in the mosh pit. But this was no run of the mill invasion of private space. It was a full on, preemptive tactical nuclear strike at my private space. The private space version of Seal Team Six storming Osama bin Laden’s compound. This otherwise pleasant woman (we chatted amiably for the first hour or so) would not stop touching me—holding my hand and lifting it up into the air, looping her arm through mine, resting her head on my shoulder. No matter how far I turned away from her, no matter how I contorted my body like a yogi, I could not escape her tentacular reach. Did I mention that I brought my 16 year old daughter to the concert? I inched closer and closer to her on my right-hand side as I sought to escape my friendly neighbor to the left. At one very loud point in the concert (Kanye West’s lower-intestine-vibrating performance?) my daughter shouted in my ear, “What is that woman’s problem?” Actually, it sounded like, “Why do goblins hate Gollum?” But that would be a ridiculous thing to have said at that moment, even with The Hobbit opening this week. Somehow, my brain intuited her meaning. Upshot: At a time when I should have been out of my mind with excitement at the panoply of stellar musicians performing before my eyes, my attention was being divided between the stage and the seat next to me. I wrote recently about praying for challenging people, so with that freshly in mind I offered some prayers for my grabby new friend. Except, my initial prayers came out mostly as pleas that some greater power would stop her. Praying for her necessitated thinking about what was going on with her, why she was behaving that way, what kind of suffering she had experienced and wished to be relieved of. With everything that was going on in the arena, that was nigh on impossible. But I did elicit some personal details. She had lost her home last year during Hurricane Irene. No doubt, she can feel more keenly than most the losses that Sandy victims have endured, and that reminder must have been painful to experience. What’s more, here she was witnessing an outpouring of love and financial support to the victims of Sandy, likely making the efforts to help the victims of Irene seem paltry by comparison. As she said to me, no one helped her rebuild her home. The focus of the prayers I offered from that point on—relief from the lingering pain of losing her home and from the reopening of fresh wounds from last year—shifted my perspective on the situation. Gradually, I felt myself relax, the tension in my back and neck melt away, as compassion for a fellow being replaced discomfort and annoyance at her behavior. I didn’t, by any means, offer myself up to be groped, but I did stop turning away from her, both physically and emotionally. I could not see how to ease her pain at that moment, but I certainly could refrain from adding to it. Be well, my friends. Peace be yours. Are thinking and meditation incompatible? I think I know exactly what Dr. Kabat-Zinn is talking about, from my own experience and from what I have heard from others who have experience both failure and success with meditation. Sometimes my meditation can leave me kind of agitated, rather than calm, if I try to fight the thoughts that arise, to stuff them down or block them out. You know, the moment you determine not to think about something, that’s all you can think about. Likewise, the moment you decide not to think at all, thoughts come streaming in from every direction! Only by accepting that thoughts arise and treating them—and myself—with compassion can I fully benefit from my meditation practice. Pema Chodron suggests that when you notice your mind thinking thoughts, just say quietly, “Thinking,” and let the thought go. Don’t scold yourself for doing what comes naturally to your mind. I do this sometimes, and when I do I always hear the word “Thinking” in Pema’s voice, which never fails to make me smile. And smiling is the perfect medium for letting thoughts slide away easily and without labeling them as something “bad” or antithetical to proper meditation. If a thought is persistent, then maybe I ought to pay attention to it. If I am routinely feeling a pain in my tooth, shouldn’t I go to the dentist and have it looked at? The pain may be a signal that there is a physical ailment that requires attention. If a thought keeps popping up during meditation—even when I treat it kindly, imagine Pema saying “Thinking,” and let it go—then perhaps it is something that requires attention. Why not let the thought run its course naturally and see where it leads? Following the thought to its resolution may be the only way to keep it from coming back. As with most things, expectations play a role in meditation. If we expect to achieve an out-of-body experience, we are likely to be disappointed. If we enter meditation, though, with the expectation that thoughts will arise, with acceptance that thoughts arising is totally normal, then we can more fully benefit from our meditation practice. In my opinion, the goal of meditation is not to experience balance and peace during meditation, but rather to experience balance and peace in our lives away from the cushion. Accept that your mind may be noisy sometimes during meditation and you are more likely to reap the benefits of meditation—a life that is more mindful, peaceful and, yes, less noisy. For much of my life I’ve been a talker—an incessant talker. When I was a kid, my dad would say I “suffered from verbal diarrhea.” Okay, he was still saying it when I was an adult. It was an apt description. I could talk a blue streak. I was often quite funny, and occasionally squeezed in something meaningful. But 99 percent of what I said might charitably be called “babble”—and that might be a generous estimate of the worth of what I had to say most of the time. It has taken me a long time to learn judiciousness when it comes to speaking—truthfully, I’m still learning. The process has moved along in stages—learning first to choose my words with care, to say much with few words. Then, learning that silence can speak volumes and is often preferable to speaking. More recently, learning to put speaking aside in favor of listening. And I mean really listening, paying attention to the person speaking, being present for them and mindful of their words and their “non-words”—the things they’re not saying. What I used to think was listening was really me paying half-attention while figuring out the next thing that I was going to say once I could cut in. I think that what the Buddha called “right speech” sometimes is best put into practice as no speech. I think that “I’m here for you, my friend” or “Go on, I’m listening”—and then being silent—is far preferable to any advice I might conjure up on a moment’s notice. Saying nothing sometimes says everything. I think it is remarkable that the sound I most associate with His Holiness the 14th Dalai Lama, Tenzin Gyatso, is laughter. I would guess that most people would not immediately think of laughter when asked to ponder on world religious leaders. Does Joseph Ratzinger, Pope Benedict XVI, make you think of laughter? Or Rowan Williams, Archbishop of Canterbury? But when it comes to this Dalai Lama, I immediately think of laughter. 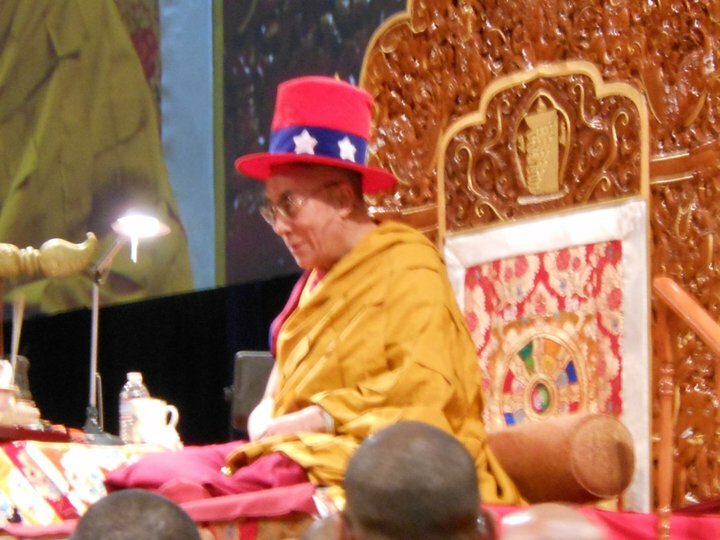 I have been privileged to see the Dalai Lama in person twice—at the Kalachakra for World Peace in July 2011 in Washington, DC, and at an empowerment in Long Beach, California, last month. Both encounters seemed otherworldly to me. He radiates a palpable energy that enraptures the audience. Perhaps the most winning thing about him is his readiness to laugh, especially at himself. 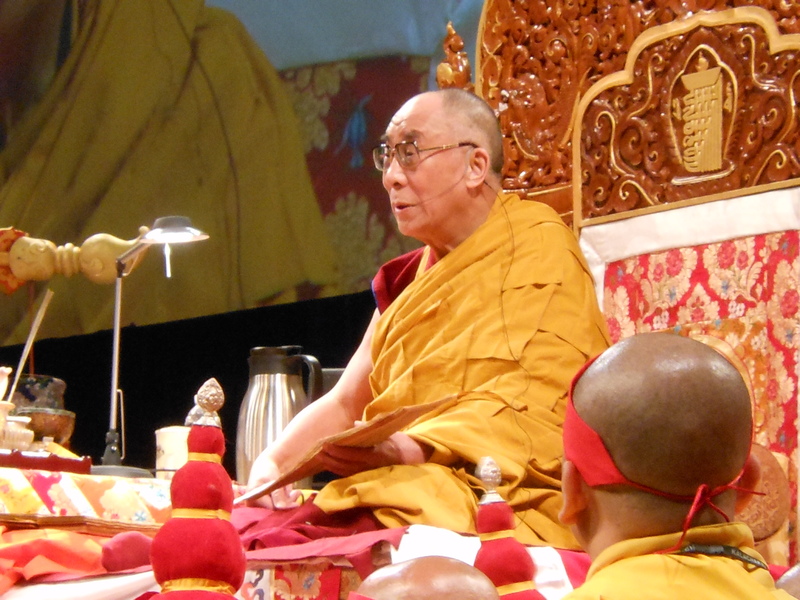 Early in the Kalachakra he spoke directly to the native Tibetan speakers in the audience…in English. 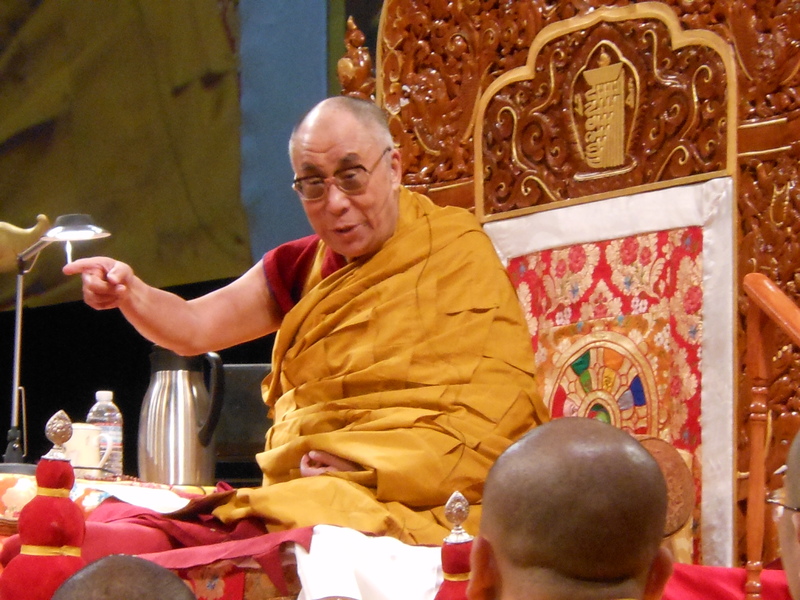 After speaking for several minutes, he realized the fruitlessness of speaking in English to persons who understood only Tibetan and erupted in laughter. 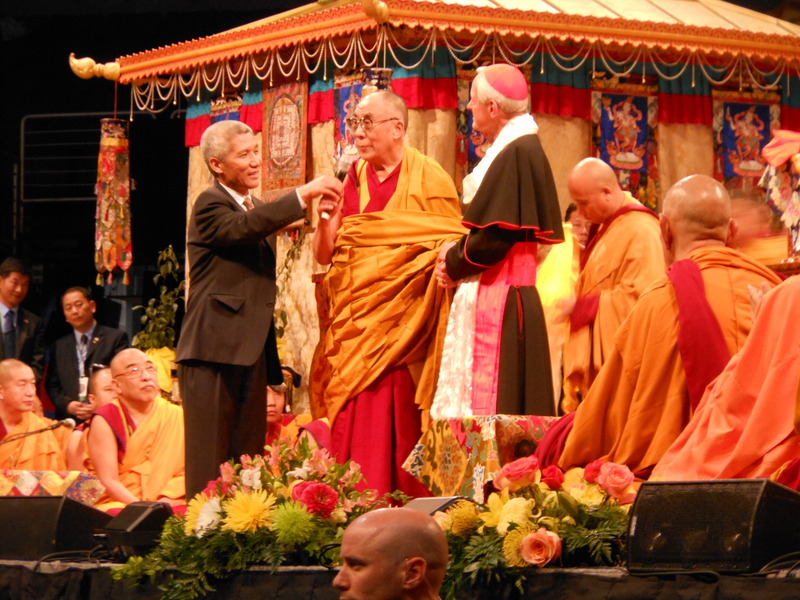 In Long Beach, he began chanting in Tibetan, only to halt after a few lines to confess, in English, that he was chanting the wrong prayer. He laughed uproariously at his mistake. It was a marvelously joyous sound both times, a laugh you might expect to hear from someone hearing a joke for the first time in his life and not quite knowing what to make of the sensation. It swept through the crowd, infecting everyone who heard it, so that all were laughing with unrestrained joy. That willingness to laugh at himself, to not take himself too seriously despite the very serious business he has to accomplish, sets the Dalai Lama apart. He is greatly revered by many, yet his brand of humility makes him seem accessible rather than lofty. Personally, he awakens my awareness of the Buddha-nature inside of me. I don’t know that it ever seems more tangible to me, more capable of emerging, than when I am in the Dalai Lama’s presence. I would liken it to a pilot light in a stove, always on though barely flickering—until the Dalai Lama turns up the gas and it bursts into flame. Listening to his recorded talks, reading his books, the flame comes alive. In his presence, it’s a roaring inferno. That experience prompts me to seek two things. One, to kindle that flame in my daily life so that the Buddha-nature in me shines forth and guides my path. Two, to recognize and become enflamed by that same Buddha-nature in everyone I encounter. Because it is present in everyone, at all times, in you, in me, always now, and not just in the Dalai Lama.